Graduate students should register for EE380L.6 and undergraduates should register for EE445M (credit for both will not be allowed). For other times email me for an appointment. Embedded microcomputer systems; implementation of multitasking, synchronization, protection, and paging; operating systems for embedded microcomputers; design, optimization, evaluation, and simulation of digital and analog interfaces; real-time microcomputer software; and applications, including data acquisition and robotics. EE445L or EE445S, and EE333T with a grade of at least C-. This class is the third in a sequence of three microcontroller laboratories. We expect you to have experiences with assembly language, serial ports (UART and SPI), periodic interrupts, ADCs, edge-triggered interrupts, FIFO queues and C programming. We will be using the same ARM Cortex-M used (since Fall 2013) in EE319K and EE445L, but we do not require prior experiences with the same microcontroller. You are also expected to understand how a DFT is used to observe digitally sampled data in the frequency domain. This is a nice book. It covers general OS topics, explains the use of µC/OS-III (a minimal but complete RTOS), and includes details of the ARM Cortex-M3 specifically on a Texas Instrument Stellaris LM3S board (not our board, but similar). There is also a second edition µC/OS-II that covers an earlier, simpler and generic OS not tied to a specific board (available on Amazon). The 3rd edition is nicely written, but specific to µC/OS-III and a given board. Joseph Yiu, The Definitive Guide to the ARM Cortex-M3 and Cortex-M4 Processors, Third Edition, 2013, ISBN: 978-012408082. For programming in C, see the EE312 text, or the Embedded Software in C online reference by Jon Valvano and Ramesh Yerraballi. 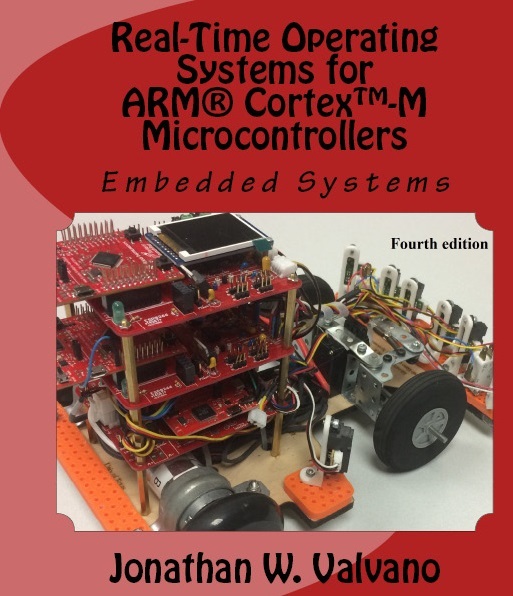 EE445L textbook: Jonathan Valvano, Embedded Systems: Real-Time Interfacing to ARM Cortex M Microcontrollers, Volume 2, Fifth Edition, 2016, ISBN: 978-1463590154. We will use the TI EK-TM4C123GXL LaunchPad plus graphics display. Each group of students must buy/borrow one kit. However, I strongly suggest each student purchase their own kit. We have been using the TM4C123 board in EE319K since Fall 2013, so you might be able to find one used. If you do purchase a used board, ask a TA or me to run the board tester to make sure it works. If it still works at the end of the semester, you will be able to sell this board to students in subsequent semesters. Otherwise, the easiest way to purchase the LaunchPad is from the TI.com E-store or any of the buying options listed on Octopart.com. Valvano Office hours: Tue 10-12 UTA7.343, W11-1 AHG126, Friday 12-2 AHG126. For other times email me for an appointment. You will need own your own digital multimeter to build and debug your robot. You must be able to measure voltage and resistance, so a meter costing around $20 will suffice. We will provide all other components and parts to assemble your final robot, including the mechanical platform as well as PCBs for a sensor and motor board into which you will plug your LaunchPads and display. You will, however, be allowed to upgrade your robot with additional sensors, circuitry and parts (except motors and battery, and within a limited budget). We will use the full licenced version of Keil µVision, Version 4.74 (do not install Version 5) The details of how to get the full license will be posted on Canvas. A large number of software examples for the board will be available by installing Prof. Valvano's starter files. To complete the labs, it will take time outside of the 3 scheduled lab hours. It will be important for you to configure a development system on your laptop (Keil version 4.74 and PuTTy) This way you will be mobile and flexible about where and when you work on lab. The purpose of EE445M/EE380L.6 is to provide students an in depth understanding of real-time operating systems, real-time debugging, and embedded systems. After the successful conclusion of EE445M/EE380L.6, students should be able to design real-time embedded systems, such as motor controllers, data store systems, data acquisition systems, communication systems and robotic systems. There will be no re-tests, make-ups or incompletes. 25% Evaluation and test procedures, how do you verify its correctness. ***Special note to undergraduate students taking EE380L.6 as their gateway grad course into the combined BS/MS program***. I strongly recommend you create a project that highlights your creativity and your analytic skills. The grad admissions committee is interested in your scientific and intellectual skills and not your engineering skills. So create a project with lots of theory, analysis, and equations so that the admissions committee will know you will succeed in grad school. Class attendance will be used for deciding grades in borderline cases. Students are expected to attend all lectures. Fundamental material will be presented in class, and the details can be found in the book, the data sheets and the library files provided by the manufacturer. Some lecture material will be posted on the web, while other material will only be presented in class. If you decide that you do not want to come to every lecture, please drop this class. All labs up to and including Lab 5 should be performed with a partner (teams of 2). Labs 6 and 7 will be performed in teams of 3 to 5 students. The lab partnerships must be registered with your TA (a simple hand written note signed by students will suffice) at least a week before the assignment is due. Once registered, the partnership will continue. A partnership can be dissolved only after discussion with the TA. All partners must be present during the demonstration. It is expected that both partners will contribute to all aspects of each lab, and all partners are expected to be present during the check out. The point values are the same for all labs. The TA will sign your software listing when you demonstrate your system. All parts of the assignment must be demonstrated to a TA by the end of your lab period the week the "Demo/Report" is due. Any EE445M/EE380L TA is authorized to checkout your lab. The report (hardware, software, data and plots) are due one day after the demonstration is due. Please consult with your TA for specific due dates for your lab section. No lab activities occur during the week of January 17. During the week of January 24-27, please go to your scheduled lab sessions in ECJ 1.318A to get a demonstration of the lab equipment. Lab partners will be selected in your lab the week of January 24-27. The lab preparations (syntax error-free software source code and documentation) are due at the beginning of your lab period. In other words, please type your software into the PC before the lab. Attendance in lab is required. All software for lab, and tests must include comments. Students are encouraged to go to the last 1 hour of the other lab periods, but the first priority will be to the regular students. During the first 15 minutes of lab, the TA will collect preparations. For the next 15 minutes, the TA will lead a lab discussion session. The remaining lab time is available for debugging and lab checkout. At the end of the semester, please verify with the checkout counter that your record is clear and you have returned all equipment or a bar will be put on your registration for next semester. All reports must be given to the TA by Friday May 5, 5pm in order to be considered for grading. "Faculty in the ECE Department are committed to detecting and responding to all instances of scholastic dishonesty and will pursue cases of scholastic dishonesty in accordance with university policy. Scholastic dishonesty, in all its forms, is a blight on our entire academic community. All parties in our community -- faculty, staff, and students -- are responsible for creating an environment that educates outstanding engineers, and this goal entails excellence in technical skills, self-giving citizenry, an ethical integrity. Industry wants engineers who are competent and fully trustworthy, and both qualities must be developed day by day throughout an entire lifetime. Scholastic dishonesty includes, but is not limited to, cheating, plagiarism, collusion, falsifying academic records, or any act designed to give an unfair academic advantage to the student. The fact that you are in this class as an engineering student is testament to your abilities. Penalties for scholastic dishonesty are severe and can include, but are not limited to, a written reprimand, a zero on the assignment/exam, re-taking the exam in question, an F in the course, or expulsion from the University. Don't jeopardize your career by an act of scholastic dishonesty. Details about academic integrity and what constitutes scholastic dishonesty can be found at the website for the UT Dean of Students Office and the General Information Catalog, Section 11-802." You are encouraged to study together and to discuss information and concepts with other students. You can give "consulting" help to or receive "consulting" help from such students in oral form. However, this permissible cooperation should never involve one student having possession of a copy of all or part of work done by someone else, in the form of an email, an email attachment file, a portable storage device, or a hard copy. Copying of any part of a program is cheating without explicit reference to its source. We do enter lab and homework assignments turned in by students through a plagiarism checker, comparing them to assignments of this and previous semesters. If we find two programs that are copied, there will be a substantial penalty to both students, e.g., failure in the course. Students who cheat on tests, homeworks or in lab will fail. Prosecution of cases is very traumatic to both the student and instructor. It is appropriate to use software out of the book, class website as long as all copy-pasted software is explicitly referenced. Copy-pasting software from current or past students is scholastic dishonesty. I strongly encourage you to study existing software. The 12th class day is February 1, 2017. The drop policy is extremely complicated. See your academic advisor or the Dean of Students for more information. April 3 is the last day an undergraduate student may, with the dean's approval, withdraw from the University or drop a class except for urgent and substantiated, nonacademic reasons. In this course e-mail will be used as a means of communication with students. You will be responsible for checking your e-mail regularly for class work and announcements. The complete text of the University electronic mail notification policy and instructions for updating your e-mail address are available at http://www.utexas.edu/its/policies/emailnotify.html. This course uses the class web page and Canvas to distribute course materials, to communicate and collaborate online, to submit assignments and to post solutions and grades. You will be responsible for checking the class web page and the Canvas course site regularly for class work and announcements. As with all computer systems, there are occasional scheduled downtimes as well as unanticipated disruptions. Notification of disruptions will be posted on the Canvas login page. Scheduled downtimes are not an excuse for late work. However, if there is an unscheduled downtime for a significant period of time, I will make an adjustment if it occurs close to the due date. The University of Texas at Austin provides upon request appropriate academic accommodations for qualified students with disabilities. For more information, contact the Office of the Dean of Students at 471-6259, 471-4641 TTY or the College of Engineering Director of Students with Disabilities at 471-4382. Follow the instructions of faculty and teaching staff. Exit in an orderly fashion and assemble outside. Do not re-enter a building unless given instructions by emergency personnel. Emergency evacuation route information and emergency procedures can be found at http://www.utexas.edu/emergency and http://www.utexas.edu/safety/preparedness/.